Tired of Using The Annoying CPAP? You hate wearing the CPAP mask all night, every night. You have difficulty in finding a comfortable sleeping position while wearing the CPAP mask. 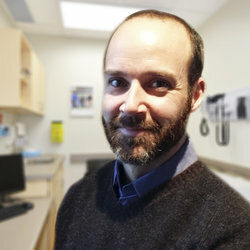 Hi, I'm Marc MacDonald, M.Sc., an Independent Sleep Apnea Researcher. There Are Scientifically Proven Ways To Completely Cure or Reduce Your Sleep Apnea! Ready For the BIG REVEAL ? "Cure Your Sleep Apnea Without CPAP" is the most comprehensive guide to “alternative” treatments for obstructive sleep apnea (OSA). A Typical Night: Snoring and Gasping for Air. CPAP is not the silver bullet for every obstructive sleep apnea patient. If It's NOT Worth Using CPAP then What Options Do We Have to Cure Sleep Apnea? You're neither doomed to use the rather uncomfortable, and somewhat unweildy CPAP machine, that you do not find as effective as you had hoped; nor are you destined to live a life blighted by impaired sleep. Through hundreds of hours of hard, fruitful research and coundless productive conversations with sleep apnea survivors - who couldn't put up with CPAP, who searched for alternatives and eventually conquered their sleep apnea, I have documented proof of scientifically proven alternative sleep apnea cures. In my documented proof - my guide , you’ll find stories that are real-life case studies of nine people who completely cured their sleep apnea through “alternative” treatments. You'll learn in-depth about their lives. You’ll get to learn from their mistakes and successes! I don’t have sleep apnea myself, but my wife and father do, as do many of my friends. My mission is, for ApneaTreatmentCenter.com to be the Web’s most comprehensive source of information on sleep apnea treatments, all written in plain English.